Biography of Elizabethan Miniature-Portrait Painter, Limner.  What is Miniature Painting? One of the best portrait artists of his day and among England's best miniaturists, Nicholas Hilliard took the art of miniature painting to unsurpassed levels. The tiny portraits he made, small enough to be held in the hand, have a jewel-like quality that is as astonishing to us today as it must have been when they were first made, in the late 16th century. Noted for his tiny oval portrait miniatures of the Elizabethan court - and its successor under James I - his clients included Elizabeth I and many other prominent Elizabethans, including Sir Walter Raleigh and Sir Francis Drake. In addition he painted numerous full-scale portraits, and was an accomplished goldsmith. He ranks alongside William Hogarth (1697-1764) and Joshua Reynolds (1723-92) as a major contributor to English Figurative Painting. Nicholas Hilliard was born about 1547 in Exeter in south-west England. His father was a successful goldsmith. At that time it was customary to educate middle-class children by placing them in a family of rank, and it seems that from about the age of nine Nicholas lived with the Bodley family. The Bodleys had to flee to (Protestant) Geneva for religious reasons after the (Catholic) Queen Mary came to the throne in 1553. Back in England by 1562, Hilliard completed a 7-year apprenticeship with the goldsmith Robert Brandon, who was jeweller to Queen Elizabeth I. In 1569 Hilliard set up in business with his brother John, and by 1570 he is recorded as a member of the Goldsmiths' Company. From the outset he was both a limner (a painter of miniatures) and a goldsmith, and when he entered the service of Queen Elizabeth I around 1570 it was in both these capacities. However, it remains unclear how, for example, he learned the art of drawing or the fundamentals of painting including the ability to mix colour pigments. 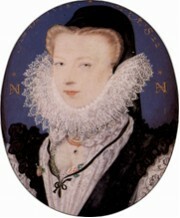 In 1573 Hilliard married Robert Brandon's daughter Alice. She would give birth to four sons and three daughters. Having earned a reputation for his work, he went to France around 1577 hoping to make a good living there. However he stayed less than two years - mostly in Paris (where he was known as Nicholas Belliart), mingling with rich and educated people - before returning in 1597, without having achieved the recognition and commissions he had hoped for. Hilliard lived and worked in the city of London for the next 35 years. However, he was to suffer from financial problems for the rest of his life: in 1617, for instance, he was briefly imprisoned for non-payment of a debt. After the death of Elizabeth I, Hilliard also worked for James I, but his style began to go out of fashion. He was succeeded by his son Lawrence Hilliard (c.1579-1640), who took over his studio and continued his work. While he was in service to Queen Elizabeth I, Hilliard developed miniature oil painting to new levels of intimacy and subtlety. The highly cultured Spanish painter and scholar Francisco Pacheco (1564-1644), from Seville, came across one of Hilliard's miniatures and wrote "The head is done with so much skill, that in my opinion it leaves far behind all of its kind. I say truly that Limning can go no farther: the art has reached perfection." Preferring the oval form (as opposed to the circular form) for his works, Hilliard's expertise is perhaps best exemplified in the miniature Young Man Leaning on a Tree Among Roses (c.1587, Victorian and Albert Museum, London), which may have been commissioned by a man as a gift to a woman to show her that his love was sincere. At the top of the painting is a motto which reads "My praised faith causes my suffering". While technically conservative, Hilliard's miniatures are executed with a fine use of line and an aversion to shadows, as well as great intimacy and refinement. Always ready to distort the proportions of his figures in order to optimize the composition, his pictures typically functioned as coded messages in the game of courtly love. A number of them are decorated with gold and bear his signature. In addition to his miniature paintings, Hilliard also explored more conventional portrait art, producing a number of full-size portrait paintings, notably of Queen Elizabeth I. The most famous examples can be seen in the National Portrait Gallery in London, and the Walker Art Gallery in Liverpool. Hilliard is remembered not only for his exquisite miniatures but also for his major treatise on miniatures called The Art of Limning (1600, Bodleian Library, Oxford). In this he makes it quite clear that painters of miniatures ranked above other painters, as they produced works of art that were fit for gentlemen and the finest enameled and bejewelled lockets worn by courtiers. His book also covered practical matters wuch as his advice to wear silk while painting as inferior clothes made dust. Hilliard's chief pupil, the Huguenot artist Isaac Oliver (1568-1617), was a more modern and technically sophisticated painter who succeeded his master as the official miniaturist to King James I (1603-25), and was also noted for his miniature copies of works by Old Masters. Oliver's own pupil, Samuel Cooper (1609-1672), who painted the portraits of both King Charles I and Oliver Comwell, went on to become the greatest miniaturist of the seventeenth century. Unlike Hilliard, both Isaac Oliver and Cooper achieved fame on the Continent. Without Hilliard's pioneering work, however, England's tradition of miniature painting might never have achieved the recognition it acquired. Miniatures by Hilliard can be seen in some of the best art museums in Britain and America. The largest collections of his work are in the Victoria and Albert Museum in London and the British Royal Collection at Windsor. Miniature painting embraces two types of picture: book illustrations in illuminated manuscripts (see for instance, Les Tres Riches Heures du Duc de Berry (1413) by the Limbourg Brothers), and miniature portraits (the type of miniature that Hilliard painted). Contrary to popular belief, the word "miniature" doesn't come from the word "minute", but from the Latin "minium", the red lead employed by medieval illuminators ("miniators") to embellish initial letters in illuminated manuscripts. Miniature portraits were also called "limnings", a term which derives from a corruption of the word "illumination." Other eminent miniaturists of the age, included: the Flemish artist Jean Clouet (1485-1540); the Flemish illuminator Lucas Horenbout (1493-1544) who was appointed court painter to the English court of Henry VIII in 1531; the great French-Swiss enamel painter Jean Petitot (16071691) who painted the miniature portrait of Charles I; and the popular Venetian pastellist and miniaturist Rosalba Carriera (1675-1757).  For an evaluation of important pictures, see: Famous Paintings Analyzed.